Yesterday I went down to Albuquerque for my first visit with an ostomy nurse. Tasya went with me and, as usual, when I was struck mute by the overload of information, she jumped in and asked the questions that needed asking. Thankfully, she’s had some experience with colostomies, with both her mother-in-law and her aunt having them! So she knew to ask all kinds of details I had no inkling about. I laughed and said I was glad she liked it! Any chance I was ever going to like it? Throughout the appointment, she was really very kind and told me over and over that I was going to do just fine. I also learned a little something about stoma caps. Carla seemed to think I would be a good candidate for eventually trying a method of irrigating daily (essentially an enema given through the stoma) and then wearing a “cap” instead of a bag. I really liked this idea – but we also discussed that I would have to see how things went with a bag for a while and work toward the cap option over time. With a colostomy, you really have no control over when elimination is going to occur, hence the need to wear a bag all the time. But, apparently by irrigating daily, it’s possible to train the body to eliminate at the same time each day and then not need to wear a bag constantly. Hey, you learn something new everyday! Tasya and I left there with an armful of literature, samples, catalogs and even a DVD for me to watch (honest to God, it’s called Ostomy Educational Theatre. Betcha won’t find that at Netflix!). We quickly dumped everything in the backseat of the car and high-tailed it to Starbucks. On Friday I have my pre-op appointment at Presbyterian Hospital, where they’ll do lab work, take X-rays and do an EKG – all to make sure I’m healthy enough to have surgery. It will be my first chance to see how I like the hospital I’m going to spend about a week in soon. Options, information, support…I like it. You sound good, and I hope that your trip to Starbucks means that you are feeling better and back on track with eating! Oh My! How could I be ‘laughing” as I read this entry. You always insert just enough humour as you write so boldly about such an intense experience. 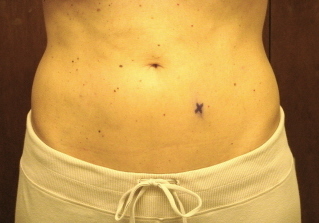 I liked your “X marks the spot” photo. You are really putting yourself out there. Again…as I read your words, I find strength FROM you, and all the time I thought I was GIVING you strength. You are amazing….and I am thinking of you today. sending lots of love and hugs to you. thinking about you and glad to read that things are going better and you seem to be in good hands. just checking in and sending good luck and lots of strength your way. xoxoxo. Carla sounds like a great ostomy nurse. Is she going to follow you in the hospital and at home? I have a friend here that just had a colon resection. It took her about 10 days to feel like she was going to make it, but now is on the road to feeling normal. You are so wonderful to share all of this with us. I find strength in all of your writings. My thoughts and prayers are with you and a special prayer will be offered on the 3rd. dear friend, your update reminds me of that quote “Pain is inevitable, suffering is optional”…not even sure I have that right, or who said it; but such wisdom! You’ve handled this entire journey with such strength, especially as you have been willing to be so exposed with your vulnerability. We ALL learn from you as you share with us! When we spoke the other day, you reminded me of the blessing of good health, thank you for that reality check! I’m packing my suitcase and heading your way soon, I promise! Love you so much, Kelly ps. is there a “jaguar” version of the bag? haha. I echo everyone’s sentiments : your strength, courage, humor throughout this journey are awe inspiring. You remind us each day how fortunate we are to have friends and love in our lives – and in particular your love and friendship. I don’t have a Cadillac or Jaguar to pick you up in, but I believe Jana is lending me her Mercedes convertible while I’m in NM – so the ride to the hospital will be in style!